It is a branch of Quanzhen (Complete Perfection) School founded in the Song Dynasty by Hao Datong, one of the "Seven Immortals of Quanzhen". Hao Datong, Zi Taigu, Title Guangningzi, is one of disciples of Wang Chongyang. He died in 1212 and was granted with the title of “Guangningtongxuan Taigu Zhenren” and the title in 1310 “Guangningtongxuan Miaoji Taigu Zhenjun”. 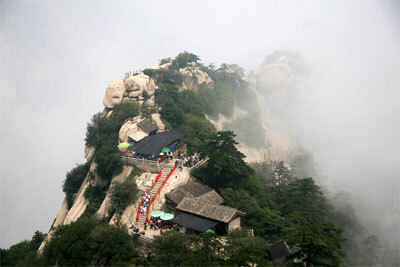 There is no systematic recording on activities of Mount Hua Sect but only some scattered recordings are available. It is recorded in Changchun Taoist Origins wrote by Chen Minggui of the Qing Dynasty that Beibenheng from Huaiyang, Zi Changji paid respects to the Wudang master Yuanzheng when he was 17 years old. Later, he followed Wang Chnagyue of the Longmen School for religious discipline practice. In 1695, he lived in Mount Gaochi in Wukang (a former county of Zhejiang Province that was included in Deqing in 1958). In 1745, he moved to Yuhang Dongxiao Palace. He died in the 23rd year of Qianlong Rein period. He made great achievement for Yi and wrote Zhouyi Canyi and Huanglaojiegui. From this saying, he should be a disciple of Longmen School since he has received religious discipline practice following Wang Changyue of the Longmen School. However, it was recorded in Jin Gai Xin Deng Volume Four Shen Qingyun Learning Biography that he should be a disciple of Mount Hua Sect, saying that “Bei Changji, named Benheng is a disciple of Mount Hua Sect”. He was a friend of Shen Qingyun, a Taoist of Longmen School. Benheng's disciple Li Renning, title Yunfeng, “sealed the niche of Shen Qingyun after his death and buried him at Jinzhuping in Mount Dadi”. It is also recorded that Bei Benheng was a disciple of Mount Hua Sect in Volume Three Fan Chuyang Learning Biography in which it also recorded that Bei Benheng followed Fan Taichu (title: Chuyang) to learn the essence of the master. It is recorded in Jin Gu Dong about Li Renning that “Yuefeng Zhenren, namely the Miaozhong Dingming Zhenren known by the public, was Li Renning. He converted to Changji Zhenren as a disciple and lived like a hermit in Mount Yunwo. He liked quite and clean environment to cultivate the heart and nature culture. He liked flowers, woods and clean places and cultivated himself for thirty years.” Therefore, it is concluded that Bei Benheng should be a Mount Hua Sect Taoist and has ever learned under Longmen School. He and his disciples lived in Deqing and Yuhang areas in Zhejiang Province in the Kangxi, Yongzheng and Qianlong years of the Qing Dynasty. Besides, it is found in the General Introduction of Various True Schools Chapter XIII the first four sentences of the words passing on from generation to generation of Mount Hua Sect from which it can be seen that Bei Benheng shall be the 15th generation of the Mount Hua Sect and Li Renning is the 16th generation.